Here we have a player character who’s become one of the central characters of the current Star Wars game by virtue of the player’s simple – and highly recommended – habit of contributing a lot of material to the game. Every non-player character in your characters background that you provide some details on, every log entry you throw a bit of character background development into, every long-term mission or goal you set up, every enemy or rival you detail, and every commitment you make, makes your character a little more important to the game. Every bit of contribution means more for your character to do, more time when your character is going to be closely involved with the plot rather than riding along with it – and a little more plot immunity, since the game master will HATE losing all that background material if your character gets killed or put out of action. That’s work that having your character around is taking off his back. Would it be reasonable to ask the game master to come to your house, get you out of bed, drag you to the game, and then tell you stories to entertain you? Well, I suppose it does depend on how much you’re paying him – but most of use run games more or less for free (chips and pretzels don’t count). That’s another critical set of items. It’s not up to the game master to drag your character into the game. The other players don’t have to listen to you. The other characters don’t automatically have to put up with your character. It’s up to you to pay attention, to keep your character involved with the action, to give him or her a reason to stay with the group, and to give the rest of the group a reason to keep him or her around. It’s up to you to support other peoples plans and motives in exchange for, or in tandem with, them supporting yours. What, your character isn’t with the group at the moment? Given that characters are generally more skilled than the players, better informed about the setting than the players, more involved in the setting than the players, have direct sensory input from the setting (unlike the players), and spend a LOT more time (their entire lives) in the setting than the players do, helping out with the brainstorming, reminding other people of things, and advancing theories – even if your character is nowhere near the scene of the action – is perfectly reasonable. You’re simply helping to simulate the fact that the Characters are experts in things that the players know little or nothing about. You just need to be careful to keep information that hasn’t yet been shared out of consideration. There’s a lot less of that kind of information than most people seem to believe too. Statements like “My character never told you that she had a sister!” don’t make a lot of sense when you remember that your character is only played for a few hours a week, with only a fraction of that spent focusing on your character, while the characters have spent six months traveling together. Game time tends to be very compressed, and a lot of things will take place between and around the times a character is actually in play. That’s why you can only hit the highlights when covering character development. 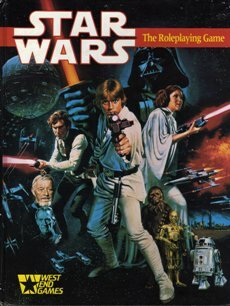 That sort of thing is why a few characters – such as Kira and Alys – have become central to so many plots in the Star Wars game, and why others – such as Handell and Shipwreck – have not; Kira and Alys’s players almost always make it, contribute material, pay close attention, advance their own theories when they see things that don’t fit, and try to work with everyone, even if they’re not in the spotlight or their abilities are only tangential to what’s going on. Handell and Shipwreck, on the other hand, simply don’t do those things much at all. “Played for laughs” can be (and is) a lot of fun too – but spinning absurd disaster scenarios in response to simple actions (“I’m going to jump down from the roof, using that awning and the force to break my fall” “And you fall through the planetary crust, setting off a new volcano in the middle of the city and launching a giant ball of flaming rock into the sky that…”) is fun for the players without requiring that you have a character at all. Similarly, trying wild off-the-wall stunts just because the game system makes it hard to die and the PLAYER doesn’t feel the pain of another week in the bacta tank isn’t going to put you at the center of plot lines, even if it does keep your character active. Given all that, here we have a reasonably current character sheet for Kira Keldav from the Star Wars campaign – at a total of 409 experience spent, with a third of those being derived from bonuses for player submissions.